The perfect combination of performance, luxury and timeless elegance, motor yacht La Dea II will satisfy even the most discerning charter guest. From her immaculate decks, the ultimate El Dorado for both swimmers and sunbathers, to her luxurious interior she promises to impress anyone who steps on board. La Dea II has recently completed an extensive refit and refurbishment, making her look like a brand new yacht. A proven world cruiser La Dea II has cruised on an adventurous itinerary that included exotic locations such as the Galapagos Islands, Pacific Islands, including the Society Islands, Tahiti, Cook Islands, Fiji and Vanuatu, and on to Australia and Asia, including Myanmar and Indonesia. Find more superyachts charters here. 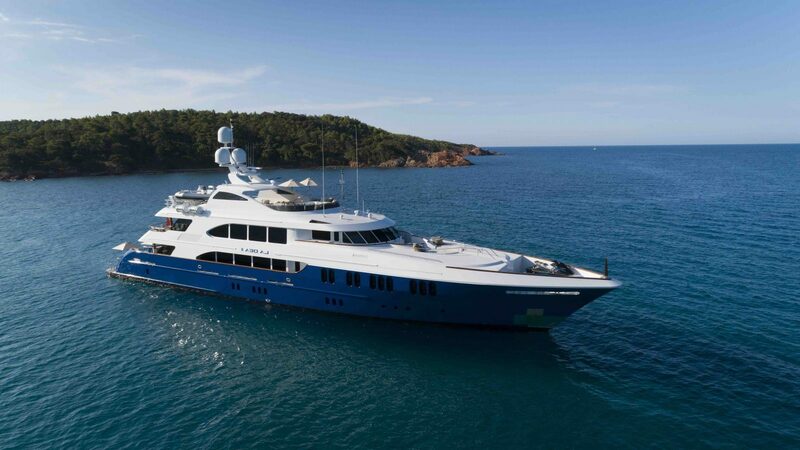 A spacious yacht, La Dea II accommodates twelve guests in five large, lavish cabins. Her full beam Master suite is situated on the main deck and features a private study area, his and hers walk in wardrobes and a large ensuite with his and hers basins, a jacuzzi bath and shower. On the lower deck are four well-appointed cabins, including two king and two twins, all with shower ensuite, plenty of storage space and flat screen TVs. 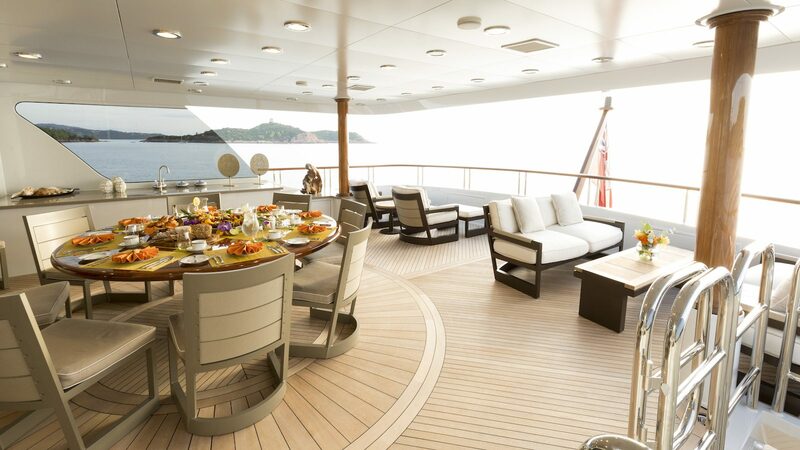 Comfortable, large spaces is a theme throughout the yacht, with several areas ideal for activities, dining and lounging. La Dea II features an impressive panoramic sky lounge and a vast sundeck, both of which underwent an extensive refit in 2014. She also boasts a huge swimming platform at the stern with two staircases leading to the main deck. Exceptionally steady, she is equipped with Quantum Zero Speed stabilizers for increased steadiness and comfort under any weather circumstance, at sea or at anchor, making for an enjoyable cruise. She can reach a top speed of 22 knots, cruising comfortably at 18 knots. La Dea II stands out for her variety in water toy, which includes kayaks, wave runners, towables and a wakeboard, allowing guests to enjoy a wide range of activities and water sports. 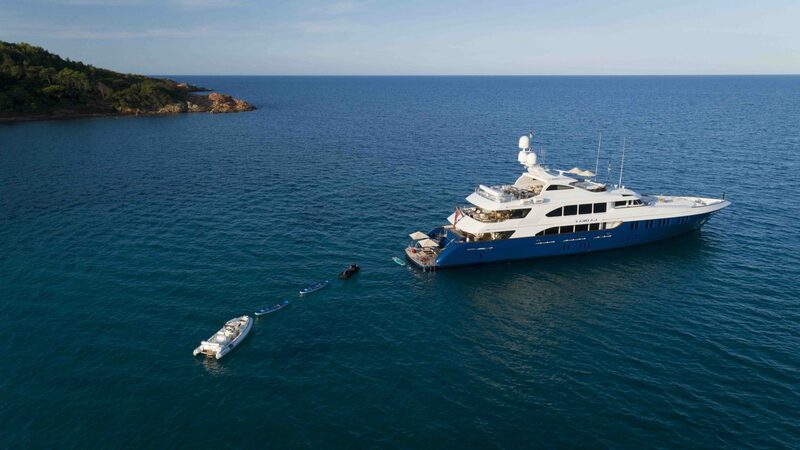 Her professional, experienced crew of nine under the command of Captain Paul Hutchinson, will ensure guests will have a memorable stay and get the very best out of their time on board. La Dea II boasts a rich selection of tenders and toys including wave runners, kayaks, wake board and towables, offering guests a wide range of activities and sports. Comfortable, large spaces is a theme throughout the yacht, with several areas ideal for activities, dining and lounging. She features an impressive panoramic sky lounge, a vast sundeck and a full-beam master stateroom. 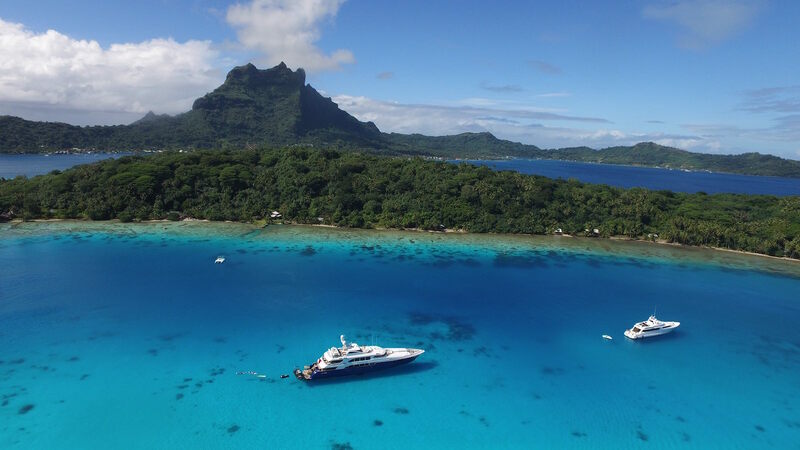 This world cruiser is following an adventurous itinerary and can take you to some of the most exotic destinations in the world, for a charter experience like no other.